About 4 years ago I mentioned on this site that I was going to be joining Weight Watchers with my wife. We both went through the program for many months, and in the end we had both lost quite a bit of weight. I ended up losing somewhere around 40-50 pounds by the time I was done. While I was happy with the program, I didn’t keep on with the maintenance program in order to keep the weight loss going, and over the past 4 years I’ve slowly watched as the weight crept back on. One pound here, two pounds there. Before you know it I had gained all of the weight I had lost back. At the end of May this year I decided that I had had enough. I had weighed myself and I was back up to my all time high weight, 278. Granted, I’m 6’4″, so I wear that weight better than some, but I know I weighed much more than I should. Having that much weight on your frame tends to weigh you down, puts pressure on your knees and back and just leaves you tired at the end of the day. It was time for a change. I’ve been through a couple of different weight loss programs in the past, but Weight Watchers just seemed to be the one that was easiest to work with, and that had enough support, resources and results to back it up, that I knew I would join them again. On May 31st I joined Weight Watchers Online, the online only version of the program. While I attended Weight Watchers meetings in person the last time I went through the program, I just didn’t feel like that part of the program was necessary for me. I’m a self starter when it comes to things like this, and I feel like the online only version of the program should work just fine, especially since I’ve been through the program before. For those that need more moral support, guidance on changing eating and exercise habits or if you just enjoy the camaraderie of attending meetings, that is still a great option. So how has the program gone for me since I joined a week and a half ago? I started the program weighing in at 278, and as of today, 10 days later, I weighed in at 271.8 – a weight loss so far of 6.2 pounds. (Disclaimer: People following the Weight Watchers plan can expect to lose 1-2 pounds per week). While Weight Watchers says people can expect to lose 1-2 pounds per week my results so far has been 4.34 lbs. per week. I seem to remember having a similar situation last time I did the program, where I lost 3-4 pounds the first few weeks, and then I promptly leveled off after that losing 1-2 pounds a week after that. We’ll see what my results moving forward are! UPDATE: 4 weeks in and I’m now down 13.2 lbs. Going well!. UPDATE: 8 weeks in and I’m now down 18 lbs. Still going well! UPDATE: 12 weeks in and the weight loss now stands at 22 lbs. The Weight Watchers program has changed since I last attended. With the program you’re constantly tracking your eating habits, with all foods being assigned a points value based on their nutritional value – the fat content, carbs, protein and so forth. In the past I was able to track my points online in their online points tracking tool. That is still available, and works well, but since I last joined the program has released a set of new apps for tracking. 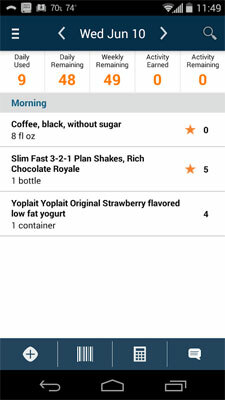 They now have a Weight Watchers tracking app for the major platforms, Android and iOS. In the past they only had an app for iOS. The app also has been updated so that it’s easier than ever to track your points and weight. The app has a handy bar code scanner. You can just scan whatever food you’re about to eat, and it will automatically bring up that food’s point value and allow you to track it. While it doesn’t work 100% of the time, I’ve only had 1 or 2 foods not come up. Even those were easy enough to enter manually. While the site hasn’t changed a ton since I last joined, there do seem to be a lot more resources available on the site from healthy recipes and help forum, to online chat if you need someone to talk with about struggles you’re having. So why has Weight Watchers proven so effective over the years for others, and for me? It helps with portion control: Weight Watchers has helped me to realize just how out of whack my portion sizes have gotten. When you’re eating more than you should, you’ll just naturally start gaining weight. With Weight Watchers I slowly start to realize just how much I need to cut back my portion sizes by. The crazy part, I leave feeling more satisfied, and less over-full. Healthier eating decisions: I’m making better eating decisions, eating more leafy greens, fruits and so on. Those types of foods are zero points on the program, and as such it encourages you to eat them. Becoming more active: When you’re changing your eating habits and seeing the weight come off, it only encourages you to be more active – to only encourage progress more! Losing weight isn’t rocket science. It typically comes down to eating healthier, watching your portion sizes and becoming more active. While it isn’t exciting, it can be tough to stick with it unless you have the help of a good program like Weight Watchers. They’ve worked for me before, and I know they’ll work for me again this time. Off to eat a healthy snack! Are you trying to lose weight currently – and if so, how are you doing it? Tell us about your progress as well! Join The Weight Watchers Program With Me! Disclaimer: This site is an advertising partner with Weight Watchers. I will receive compensation if a new member signs up through one of the links above. Please know that this review does discuss my true feelings of the program and how it has worked for me. Great job on the progress you’re making so far, keep up the good work! I know some people who have been successful on Weight Watchers as well. A big part of that has to do with the portion control as you mentioned in the post. Yeah, the portion control is huge for me. I typically will eat whatever is in front of me. Weight Watchers forces me to be more cognizant of what I’m actually eating.